A web banner or banner ad (also sometimes called a display ad) is a form of advertisement that is served by an ad server. As online advertising has become a mainstream marketing strategy over the past 25 years, the banner ad has been the OG, and is distribute not only on publisher sites online, but also all over social media. We compiled a list of the best tools, templates and rockstar examples so you can create a banner ad that is creative and gets audiences to click. Don’t let your ad be struck by banner blindness. Read other innovative marketing strategies that go way beyond web banners. Canva allows marketers and graphic designers to create visual content that spans from social media posts to resumes to web banners. Canva works for beginners with absolutely no experience, too, with its simple editing platform. Canva offers pre-designed banner templates that users can easily edit and customize. You can customize fonts, background colors, font size, and stock images. It’s a great option if you need a solid starting point and some inspiration. Bannersnack calls itself the original banner maker. But today, their tool has evolved to incorporate banner design like interactivity, animation, and more. The workflow of Bannersnack is geared towards the banner designer who knows exactly what she wants, from size to color customization. Need a 250×250 ad? A 320×50 optimized for mobile? A half page 300 x 600? All of these and more are supported. What’s helpful too is you can save your work in multiple file formats (JPG, PNG, MP4, HTML5, GIF) to help address any content need you have for your banners. Adobe Spark is a free design app that allows you to create professional-grade banners even from your mobile device (for iOS). Adobe Spark in particular works well for social media banners and content. If you are looking to create ads that jump off the screen and really capture your audience’s attention, immersive content is your best bet. OmniVirt’s Ad Manager lets you create 360° or 3D Photo banner ads for a new kind of interactive experience. Read more about how immersive ads like 360° and 3D are part of the future of advertising. Fotor is a photo editing platform that provides numerous templates, built-in images and shapes, hundreds of font options, and color editing options like transparency and color picker. Like Bannersnack, Fotor lets you start creating your banner after you indicate a size. Bonus: you can create custom ad sizes as well. Fotor is a good option if you want to create a banner that features a real-life photo. If you want to build animated banners, HTML5 Maker might be the right pick for you. HTML5 Maker also gives you easy options for when you’re done creating your ad: Download as an HTML or GIF, Embed as Responsive JS or a ClickTag, or submit to AdWords. HTML5 Maker promises that your banners will be responsive, meaning they’ll look good no matter the screen size. Google gives out yet another valuable free tool, but this one allows you to create interactive HTML5-based designs and motion graphics that can run on any device. It also offers a full design suite and if you’re code-inclined, you can also customize (but it’s not required). The Interactive Advertising Bureau (IAB) is a membership-based trade group that puts out technical standards, research, and best practices around digital marketing. Keep a copy of the IAB’s Standard Ad Unit Portfolio to stay on top of ad sizes, file specs, etc. Once you create a banner, you may need to add a click tag so you can track the performance of the ad. A click tag defines click-through URLs for each exit of your banner ad. Here’s a handy guide from Google on requirements. Moat is a 3rd party verifier that helps brands verify the performance of their ads. One cool trick is that its site has visual copies of every live ad. Search for a brand and each campaign will be displayed, thereby creating a full catalogue of pretty much every display banner ad currently live. Dribbble is an online community for designers and creatives. This site has tons of design inspiration and contacts to help with asset design for display ads. Before you go about designing your first web banner, consider the best banner size that will meet your brand’s needs. Many of the examples below are 300X250. Building animated ads can work across different sizes, as this WordStream example shows. This KIND ad cleverly showcases the variety of flavors and natural ingredients used in their products through a simple but creative layout of their bars. The copy is simple to help give more real estate to the product image. 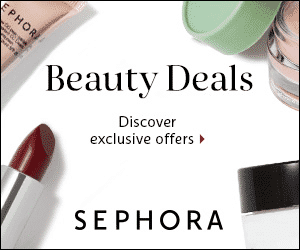 In this Sephora example, the products are not center-stage, but helps frame the CTA: there are deals and exclusive offers with these products and more. 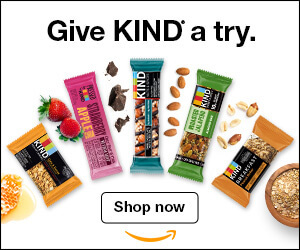 These “hints” of products in the ad help convey the message that there is more to be discovered…just click on the link! This GlaxoSmithKline creative asks the user to interact with its ad. Part of its appeal tugs at a user’s curiosity: What will happen after I click and drag the pill into the mouth? This IKEA creative hits the point that IKEA solutions fit your space. It asks a user to adjust the size of the ad to hammer down its message. See other banner ad examples. Chips brand Takis went 3D with their interactive 3D Display Ad. Sony Pictures created a 360° display ad banner to promote its new film Escape Room. The display ad automatically rotates around the 360° content and when a user moves her phone around, the ad will respond. You can design these kinds of banners using OmniVirt Ad Manager. This demo of a Coca-Cola display ad incorporates 3D Photography to add in a layer of depth. 3D Photo web banners in various sizes can be made at omnivirt.com/3d-photo.